My previous life as a student in the art of screenwriting left its mark on me. I always think about the dramatic structure of a film. I’m constantly worrying about the “want” or “need” of a character on television. And, most loathsome of all, I still peruse the trades every week. Reading sites like Variety, I’ve learned all types of stupid things I wish I could unlearn. Did you know that the new Pirates of the Caribbean is going to have its international premiere at Cannes Film Festival? Or have you heard about the arena show Batman Live? It all sounds like pretty rough stuff, but that all pales in comparison to what I read today. 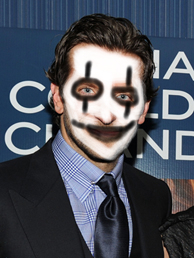 Bradley Cooper is in talks to star in a remake of The Crow. There, I’ll let that sink in for a moment. Okay, done seizing? There are a lot of things wrong with that sentence. I know it’s almost become cliché to say things like “why would they ever make a remake of that.” I know why they’d make a remake of that, because it will make them money. But truth be told I honestly wonder how much money they can squeeze out of a remake of a cult classic. Is this a franchise worth revitalizing? The first movie was great in that classically 90’s way: grainy, swirling, more like a video game than a traditional narrative. I wonder how well it will translate in this modern age. I like Bradley Cooper. I think he’s a fine actor. He chooses his roles very carefully (it seemed) and pulls them all off with a bizarre mix of slimy assertiveness and affable charm. Hell, I even met the guy once, and he was nothing but gracious and patient. All that being said, he’s set to play the title role. I could see him agreeing to be a police chief or a news reporter, but can you imagine him in the role that Brandon Lee died while playing? Can you imagine him donning the white pancake makeup and black eyeliner? Perhaps I can’t imagine Cooper as an action star because he hasn’t really played one yet. It’s rare that I hear about a project that I assume I will dislike. I think this strong revulsion I’m feeling stems from my adolescence. The Crow, for me, was this strange, hyper-violent movie my friend kept telling me about. At a sleepover he’d proclaim, “Oh, we’re gonna watch The Crow when my parents fall asleep.” And once they did the VHS slid into the VCR and I was, in some small wall, transformed. Resurrection from death. Serious gunplay. Drug use and sexual overtones. These were things I was probably too young to watch. In that way The Crow was, for me, a rebellion on video. I can’t help but wonder what the tone of the remake will be. Will they remain true to the original grit of the first film? Will they get flashy and jump-cutty (enter that word into your dictionary, OED)? Will Ernie Hudson reprise his role!? The director slated for the project, Juan Carlos Fresnadillo, also directed 28 Weeks Later. I'm filled with a certain sense of dread. Maybe I’ll be proven dead wrong and I’ll get to eat my words and enjoy the film. If that happens, I’ll be the first to review it for the site. Maybe I’ll love it, as I do most movies. Then again, maybe this will be just like The Crow: City of Angels.